When this Lakme clean up range was launched it consist of a face wash, scrub and a mask and this set of three has three different variants like Nourishing glow which comes in red pack consists of nourishing glow face wash, scrub and face mask, then the Lakme fairness range, the baby pink one, that also has the three products and lastly they had launched Lakme face Clean up Clear pores keeping in mind the oily skin. 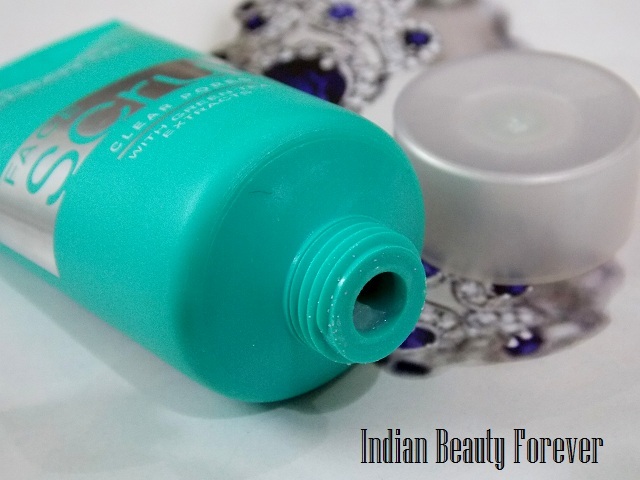 I have got the entire range of Clear pores and Today, I will review lakme clean up clear pores scrub as I really like it and it is the one I have used it first. Winters approaching and skin tends to get dry. Even if I have combination skin my cheeks which are normal tend to get dry at times and flaky too. I have always loved scrubs as they not only exfoliates to reveal a healthy, smooth and glowing new skin but also clear pores by removing dead skin cells thereby lowering the chances of skin problems especially if you have acne prone skin like me. This is the reason why I love trying scrubs, but you have to keep in mind not to over exfoliate your skin as it can be damaging. Check and see how often your skin requires scrubbing. Normally it is twice a week for oily skin and once a week for dry skin. Key Features: Green Tea extracts to soothe skin. Salicyclic Acid to prevent breakouts & fight blemishes. Suitable for Normal to Oily Skin. Dermatologist tested, Non-comedogenic, Hypoallergenic. 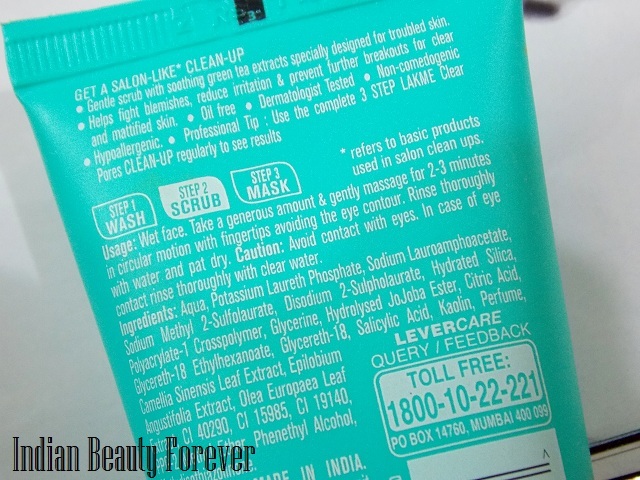 Lakme Clean up clear pores scrub comes in a bright sea green colored tube which looks really good and quite travel friendly. The scrub is a minty green formula which looks like as if there are salt crystals suspended in a gel base but they aren’t salt crystals. The particles are quite dense and are that of the size if table salt by which you can assume it will not be very abrasive but still gives gentle and effective exfoliation. I like it for the only reason that the particles are very small and you can gently scrub your skin due to which it can be used daily on the blackhead prone areas. It unclogs pores as well. I splash my face with water and then take around, two pea sized amount of this clear pores scrub for oily skin and then in outward, circular motion, I scrub my face. Concentrating on my nose which is very oily and prone to whiteheads, then the sides of the nose, foreheads, chin and cheeks. Never be harsh while doing this as it can make your face red and rashes can be seen. After scrubbing for about 2 minutes, I rinse it away and while I touch my face, it feels smoother and brighter. It has a very mild fragrance and I have seen that while I rinse it off, it lathers though not too much. So, at the same time it cleanses too, It is because of the Potassium laureth Sulphate in it. By the way this isn’t harmful as Sodium laureth sulphate. It claims to have green tea extracts which I would say is a good thing as it is a powerful antioxidant so after I am done with scrub, I noticed that pores on my nose were shrunk and aren’t noticeably though it’s temporary but green tea also gives this product a refreshing overall feel. Apart from that, It has salicylic acid that is said to prevent pimples. This tube will last for more than 2 months if used twice a week and considering it’s price, I will call it as a budget buy and affordable of course. It’s a good to try product for oily skin though can be used by other skin types too and for the sensitive skin, yes, I will recommend it. Just a tip for sensitive skin, once you use any scrub, splash your face with water and then take the scrub in your palm and dilute it with some water, this way the formula will be diluted and particles will not be too abrasive on your skin and remember to be gentle!! It’s your face after all and you have got only one!! Wrapping up with pros and cons now! It comes from a brand that is easily available at every drugstore, beauty, cosmetic shop etc. For that price, it is very affordable. Scrub particles are very dense and still small which makes them gentle. Helps in uprooting black heads and whiteheads, yaay!! Take- I will highly recommend this Lakme clear pores scrub to people who have oily skin and even sensitive. It’s affordable, the tube will last for more than two months if used twice a week. Does gentle exfoliation for a smoother and clear skin after which pores are also minimized due to its green tea extracts. PS: PR sample though the review is honest as always!!! Is that good!! Oh my, nice :) will give a shot ! It's a nice scrub...It doesn't do anything to prevent breakouts though but otherwise is a great exfoliator :) Nice Review.. So true!! it doesn't :) Thank you!! What! 5 on 5.. No I have to try it out :D Great review doll.. Sounds like a great product Niesha! voww.. wud love to try this.. nice one Niesha.. good review!! Do try it! Thank you! I am really fond of their strawberry face wash, would love to try this one .. I tried that range';s facewash but after trying this scrub, I really like to try that one too. Currently am using the strawberry scrub...ad this also looks good Niesha..
You are right dear, it has Citric acid! oh this sounds great 5 out of 5 superb! Is it this good Neish, then I must definitely try it, will get it next time when I'll go shopping, lovely review. Yup it is! :) It does mild exfoliation and good for sensitive skin too. Thank you! I am currently loving it. I use this and face pack back to back twice a week and they clear my stubborn white heads. I just mostly just use this on and around my nose where I get oily and have whiteheads. It really smoothens out the area nicely. Now I am curious to try the pink packaging one even. Good to know that shweta!! and same here I have whiteheads on my nose and they seem to go away after using this. Even I want to try the pink wala now. Surely picking this one next.. that green tube looks so refreshing! Thank you :) you should! 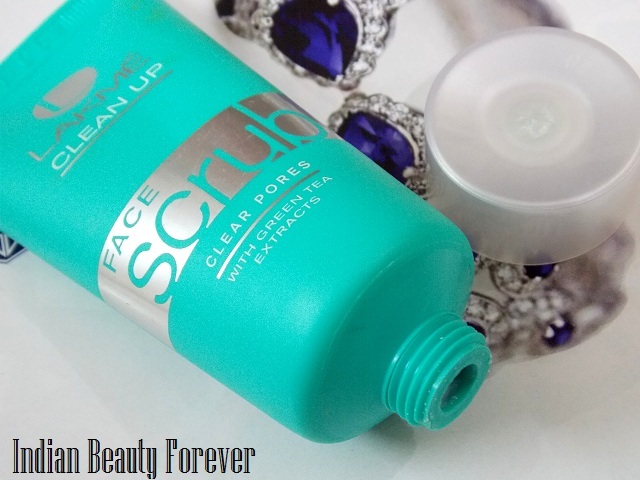 Nice scrub, pictures and review! Nice review Niesha. I like this range as well. I like this range too!! Full rating. Will definitely check it out :) Nice review Nieshu! Lovely review....I love it too! just too amazing! They are such a budget buy! Thank you Richa! :) I agree, they are a great buy! Totally loved your detailed review, will try out soon. Thanks sweetheart.